For most RVers, driving a motorhome is the best way to travel. However, if you have a decent towing vehicle, there are plenty of reasons to have an RV trailer instead. If you do decide to go the trailer route, however, then you’ll want to get an electric trailer jack. Although electric jacks are not necessary for towing your mobile home, they make life that much easier. If you’re planning on parking your RV in one spot for weeks or months at a time, then a manual jack may be okay, but for those who travel regularly, an electric model is the best way to go. So, with that in mind, we want to take a look at the best electric trailer jacks. Once you’ve seen how convenient and simple they are to use, you’ll wonder why you ever dealt with a manual jack before. When it comes to trailers and hitches, Husky is a brand that is well-known and trusted in the industry. Compared to some of the other companies out there, you can depend on Husky to have some of the most rugged devices available. In this case, we have the Super Brute, which has one of the highest lift capacities, as well as a solid steel body that won’t quit under any condition. Let’s see how this electric jack can help you with your RV. One of the most crucial things to do when choosing the best electric trailer jack is to determine your trailer’s tongue weight (more on that down below). If it’s not sufficient, then the jack will strain itself and could break immediately. Fortunately, this particular model has one of the highest lift capacities we’ve seen, so no matter what kind of trailer you have, whether it’s a small travel camper or a full-size RV, you can lift it without any issues. Typically speaking, the most significant downside to getting an electric trailer lift is the fact that it can break down either electrically or mechanically. Unlike manual lifts, you do have to worry about the more sophisticated elements holding up to the weather. Thankfully, Husky has you covered with an insulated control box with a weatherproof LED panel. Not only will this device hold up in the wind, rain, and the cold, but the LEDs notify you of how it’s working and whether you’re ready to go or not. Overall, this electric trailer jack is both convenient and helpful, mainly if you haven’t used one before. Since these devices run on electricity, you need to hook them up to your battery. However, assuming that you’re not using the lift all the time, you need to be sure that it won’t drain your RV’s battery overnight. Fortunately, the Super Brute has a high-tech Sleep Circuit that prevents the unit from drawing power, even when it’s not working. Since this can be an issue with other electric trailer jacks, it’s nice to know that you don’t have to worry about this model. Overall, if you’re looking for a high-quality lift that is both reliable and easy to use, the Super Brute is the best option out there. I like that it’s strong enough to work on almost any size RV, as well as easy enough for virtually anyone to use it. Although the remote control is a nice feature in theory, in practice it’s not very useful. Not only does it need a direct line of sight, but it can be glitchy at times as well. Also, as with any electronics that sit unused for a long time, this trailer lift can sometimes break down, particularly if you leave it plugged in for weeks or months. If that does happen, you’ll probably have to replace it with a new model. Do yourself a favor and read the manual on how to take care of your lift during your RVs downtime. Although most electric trailer jacks are designed with RVs in mind, the fact is that some of them are built for other environments as well, including towing your boat to the marina. This super simplistic model from Goplus is one of those, meaning that it has some extra bonuses you can expect. Since this model was made for marine environments, that means it can withstand the elements much more easily. Rather than corroding because of some rain or cold, it’s built to handle seawater, which is going to damage your lift more than anything else. Also, because this unit is built for marine docking, it’s much simpler and more efficient than those made for RVs. When looking at it, you can see that this jack has far fewer bells and whistles, which means that it focuses more on function than form. Considering that you have to connect your electric trailer jack to your RV’s battery supply, installation can be tricky for some people. Fortunately, this one links directly to your towing vehicle via the seven-pin connector attached. Because of this setup, all you have to do is plug the lift into your tow vehicle, and you’re ready to go. That also means that you can’t raise or lower your trailer without that vehicle in place, but that shouldn’t be an issue overall. Typically speaking, trailer jacks are made for 2.25-inch hitch balls. Since this is the size used for most RVs, it makes sense. However, if you happen to be using a trailer that has a smaller two-inch ball, you need to make sure that your jack can accommodate it. Thankfully, this one does. I appreciate that this electric trailer jack is made for marine environments, thus ensuring that it can stand up to many different weather conditions. If it can hold up against saltwater, then it can withstand almost anything. Although this jack is simple, it’s not made for heavy-duty use. It’s great for sitting unused for months at a time, but if you RV a lot and detach your trailer most of the time, this jack may blow fuses relatively fast. As you’re comparing different electric trailer lifts, you may decide that you want something more rugged or something a bit more high-tech. In this case, the Tongue Jack from Best Choice Products is one of the former options. Looking at this lift, it seems like it can weather almost any conditions, thanks to its simplistic design and hardened construction. Let’s see how it holds up against the other models on this list. As with anything related to your RV trailer, you need a lift that can withstand the elements. Also, because this is an electric model, you have to be sure that it won’t break down after the first rainstorm. Although this particular model is not as insulated as the Super Brute, it does have powder-coated steel, which helps it maintain its strength and efficiency in almost any conditions. Also, because there aren’t many buttons or electrical components exposed, it lasts longer than some of the other units out there. As I mentioned, one of the most crucial elements of any electric trailer lift is its weight capacity. As you’ll notice, this one is much less than the Super Brute, but the fact is that many of these devices are rated for only 2-3000 pounds or so. Realistically, you won’t need a lift that can handle much more than that, so this unit (as well as the rest of the models on this list) should be sufficient for almost any RV. More lift capacity is designed for bigger rigs and to ensure that you have a buffer range, just in case. Although the weight limit for a lift is essential, so is the height of the rig itself. You need to be sure that the jack will be able to lift your RV high enough to couple with your tow vehicle, especially on uneven terrain. For the most part, 18 inches is the standard, so you shouldn’t have any issues with this model. Still, you want to pay attention so that you know what to expect when using the jack in the real world. This is a simple and easy to use electric trailer lift, which makes it ideal for most RVers. I like that the installation is a relative breeze, as well as the fact that there is just one button to avoid confusion. Finally, I appreciate the rugged design. Compared to high-end models like the Super Brute, this electric lift doesn’t insulate the electronics as well. Although it can hold up in most weather, you may need to replace a fuse every so often. Also, don’t buy it if you have a two-inch hitch ball, as it won’t fit (although the specs say it will). As you can see, most of these electric trailer jacks have a lift capacity of 3500, meaning that you shouldn’t need much more than that for your RV. In this case, we have a remarkably easy to install and use model from Lippert. Let’s see what it can do. One thing that you have to consider when picking out a trailer jack is the fact that you may have to couple your RV at night. If that is the case, you’ll want to be able to see what you’re doing. Fortunately, this model comes with extra-bright LED lights that both illuminate the control panel and the hitch. This way, you can make sure that you’re locking your RV to your towing vehicle correctly without having to fumble with a flashlight. When you use an electric trailer jack, you’ll notice that many of them are pretty loud. This sound is because the gears inside are turning and grinding against each other. Thankfully, you don’t have to deal with so much noise from this lift, as the gears are helical, meaning that they fit together more smoothly. One element that all of these jacks have in common is the inclusion of a manual hand crank. Although ideally, you’d never have to use it, the fact is that the machine may stop working for a variety of reasons. In some cases, the battery may be dead, or the electrical components inside may be worn down. Also, fuses can blow out if you haven’t used the jack in a while, which is why cranking it manually is always an option. If you’re looking for something simple and elegant, then this is an excellent electric trailer jack. I like that it can install easily, as well as the extra LED lights included for better visibility at night. Although I highly recommend getting a wider foot anyway, it is kind of annoying that this jack doesn’t come with a foot already, forcing you to buy one separately. Also, the lights are helpful, but they can stop working suddenly, and they are difficult to replace. Much like the Super Brute at the top of this list, we’re finishing with a rugged and burly electric trailer jack. This particular model is built to be both convenient and heavy-duty, so let’s see how it compares. Although we’ve seen that most trailers are fine with a 3500-pound jack, it’s nice to have more of a buffer. As I’ll discuss in the buyer’s guide below, you never want to max out your jack’s lifting capacity, so having an extra few hundred pounds is a blessing. As I’ve mentioned multiple times, electric lifts are not immune to breaking down, particularly if you don’t treat it with the care it deserves. Thankfully, this particular model makes it easy to operate the lift if it does shut down, thanks to the manual override on the side of the machine. Yes, 18 inches is the standard, but sometimes you need a little extra height to ensure that your rig is level. This additional height is perfect as well if you have a weight distribution coupler that measures both the front of your RV and the back of your towing vehicle. For the most part, you shouldn’t have to use this extra foot, but it’s there just in case. I like that this rig is built tough and that it has a higher load capacity. I also appreciate that it comes with large, weather-resistant buttons and a manual override for emergencies. In rare cases, the gears may jam, meaning that you won’t be able to use the jack, manually or otherwise. Also, if something does happen with this machine, reaching customer service can be a huge pain, so plan accordingly. What Is a Tongue Jack and How Does It Work? Although I’ve been showing you a bunch of electric trailer jacks, you may still need to know how they work. These mechanisms are designed to lift and lower the front of your trailer so that you can couple to your towing vehicle. Normally, this process is done manually, meaning that you have to use a hand crank to get it up and down. By installing one of these machines, however, you simply have to press a button, and it will do everything for you. These devices usually run off of your RV’s battery, so installation can be somewhat tricky. In some cases, however, they may utilize a seven-pin connector, meaning that you just have to plug it into your tow vehicle to get the power you need. What Is the Right Trailer Weight Capacity and Height? As I’ve mentioned, the weight capacity for an electric trailer jack is crucial. However, when looking at the overall limit, you have to realize that the tongue (where the trailer couples) is not the same as the gross vehicle weight. As a rule, you want to assume that the tongue is between 10-15% of your trailer’s total weight. So, if you have a 10,000-pound trailer, you should anticipate needing a trailer jack with about 1,000-1,500 pounds of lift. Here are a few other things to keep in mind, however. Give Yourself a Buffer - add another 500 pounds if possible so that you don’t strain the jack by maxing out each time you use it. Measure From Loaded Weight - a full trailer is heavier than an empty one, so go with the more massive load limit for safety. Do You Have a Weight Distribution Hitch? - If so, then you need to lift both the trailer and the back of your tow vehicle, so add extra weight to accommodate it. Most of these jacks come with feet attached, but some of them don’t. Also, in most cases, the foot is a circular one, which isn’t ideal for rough or uneven terrain. Whether you have a foot already or not, I highly recommend one of the following two upgrades. This is the best foot option for most trailers as it gives you more surface area when it’s on the ground. Thus, if the terrain is uneven or soft, you can still maintain better traction when lifting and lowering your RV. The shape of this foot is rectangular. If you’re worried about the foot hitting the ground while driving, then this model may be a better option. Instead of raising up into the jack, it will fold underneath the trailer’s A-frame. One word of warning with this foot, however, you can’t keep your trailer at a grade above three percent, or it could cause the foot to fold, which can result in disaster. 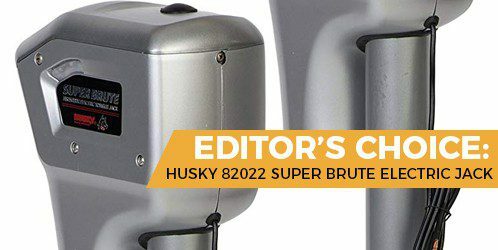 Although each of the electric trailer jacks on this list is reliable and worth your time, I have to say that the Super Brute from Husky is my top pick. I love this jack because it has the best lifting capacity, it’s the most well constructed, and it’s one of the easiest to use. Overall, you can rest easy knowing that your trailer is in good hands. Just be sure to take care of your machine, and it will last for years.